Glue-bound pad contains 50 sheets of smooth surface texture paper that is ideal for practicing italic lettering. This 19lb (74gsm), lined paper pad is available in a 9”x12” size only. 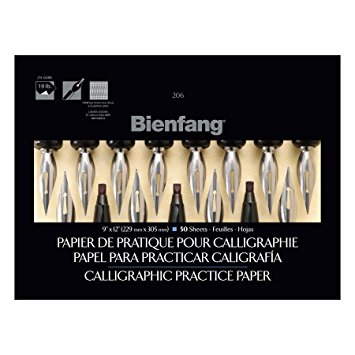 Excellent, fine surface texture paper specifically designed for use with pen & ink. Each package contains 50 sheets of 60lb (74gsm), acid-free paper. Available in 8.5”x11 size in White, Gold and Assorted color packs.